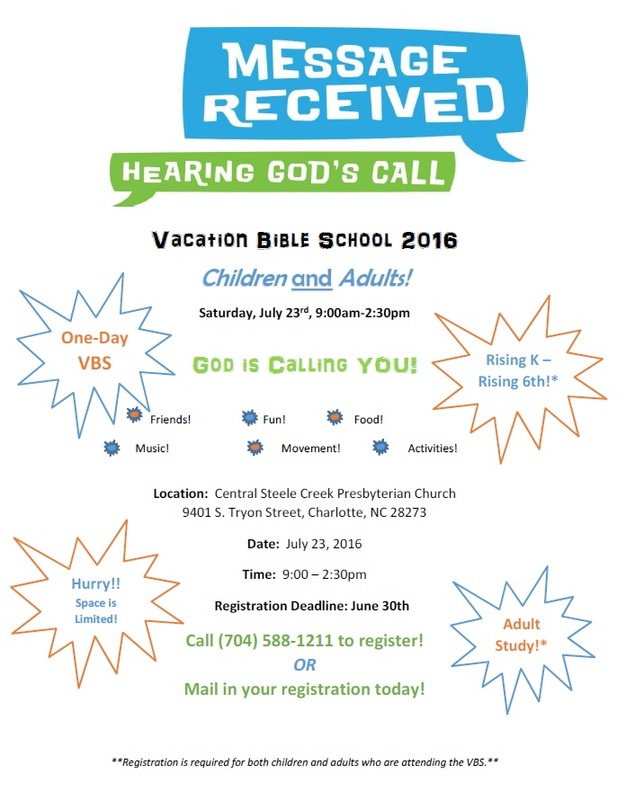 (July 8, 2016) Central Steele Creek Presbyterian Church would like to invite children and adults to attend their free Vacation Bible School on Saturday, July 23. The children's program lasts from 9:00 AM to 2:30 PM. Adults can select either morning or afternoon Bible study. Please download, complete, and return the attached REGISTRATION FORM to the church or email it to admin@cscpc.org. Although the flyer and form says to register by June 30, they are still accepting registrations. Central Steele Creek Presbyterian Church is located at 9401 S. Tryon Street, at the corner of South Tryon Street and Westinghouse Boulevard. It has been serving the Steele Creek community since 1893. Direct questions to British Hyrams, Director of Christian Ministries, at british@cscpc.org. To comment on this story, please visit the Steele Creek Forum or the Steele Creek Residents Association Facebook Page. Click here: to share this story to your Facebook page, or click below to visit the Steele Creek Residents Association Facebook page.